rehabilitating, social and of course fun-filled festival of the senses? Well, if you are anything like we are, the answer is OH SO VERY! If you reside in or around the Scottsdale or Phoenix Arizona, Las Vegas or Southern California areas***, then the next time you want to immortalize a gathering of those closest to you, allow our licensed, professional therapists and technicians to help create amazing spa parties that will be remembered and revered forever. One call to us can result in the organized and timely delivery of luxury spa party services to the door of your home, office or even hotel suite. There is no better way to celebrate birthdays, spa party manicure anniversaries, weddings, reunions, or any other social event than by throwing spa parties. Invite a group of your closest friends for massages, facials, and mani-pedi's at your next slumber party, girl’s night in, bachelorette party, pool party, reception or retreat. 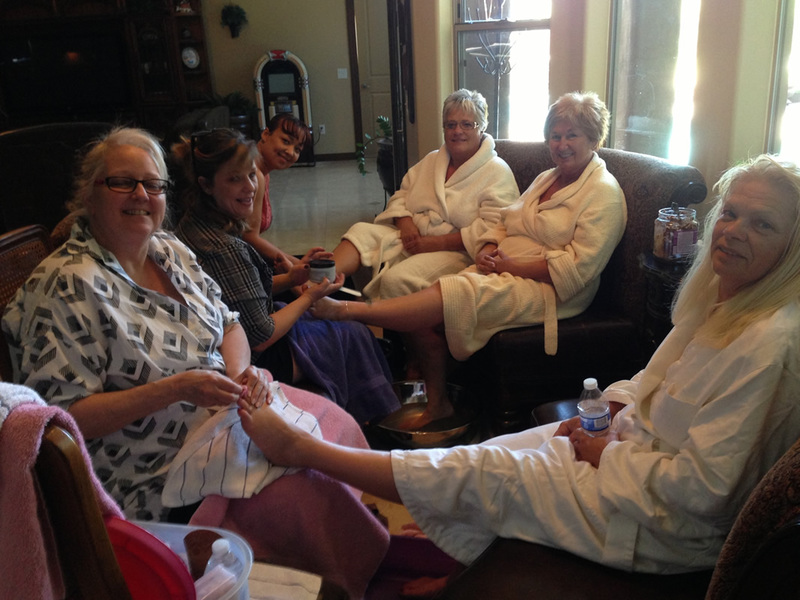 Even your book club would love to have spa parties while discussing the latest assigned literary treasure! Our therapists and technicians provide licensed, insured, professional, courteous and highly experienced in-home, outcall and on-site spa parties for anyone and everyone who desires pleasurable pampering, relaxation, and respite in the midst of the stress and chaos of their daily routines and lives. With our comprehensive spa parties, you can pick and choose only the services that you want for your group, and turn the day into a personalized, individualized, unique and of course, amazingly fun social occasion and event. In addition, you can even add a multi-course gourmet meal, courtesy of our personal chef, to any of our customized spa parties packages. After all, being pampered in the lap of luxury spa Party Pedicure all day can sure work up quite the appetite. Furthermore, we also offer other event coordination services to accentuate spa parties, including onsite live music from bands or DJ’s. When the time comes for you to celebrate life to the nines, allow our spa parties service experts to help plan, coordinate, facilitate and execute a one-of-a-kind event you and your friends will never forget! ***Please note that in Southern California and Las Vegas Nevada, only massages will be performed in lieu of comprehensive spa parties. Spa parties, facials, nails, and hair can only be performed on clients at their residence, hospital or nursing facility, if due to illness or other physical or mental incapacitation that prohibits them from attending a salon or gathering at an authorized social venue. If this is the case, then we can perform those services, but for insurance and other legal reasons proof of circumstance and need for accommodation may be required.